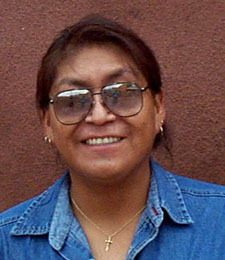 Pernell Laate, Zuni, is highly regarded for his intricate fetish carvings in bone and antler. His animals perch on a rocky terrain and twist toward a sound in the forest, or lunge toward their prey. Pernell is able to capture the essence of the animal and its existence in nature. Occasionally he carves out of wood, as he did here with his kachina, “The Wood Gatherer,” also adorned with beads and deerskin. A kachina is a spirit doll that communicates with Great Spirit and so can give us guidance, as do the animals depicted in fetish carvings.